WhatsApp is one of the most popular instant messaging present, Whatsapp already gained a huge number of users across the globe. You can now send text messages, photos, voice, videos and connect with your friends and family. One of the most common problem WhatsApp users have been facing is having trouble backing up chats and restoring data. Even you will need to restore WhatsApp when you switch your phone. Follow this detailed guide which explains how you can restore your previous chats and other data on Android phones and iPhone too. Go to WhatsApp Settings > Chats -> Chat Backup; if there are backup files displayed on the screen, it means you have backed up WhatsApp before. Delete WhatsApp from your iPhone and reinstall it from App Store. Verify the phone number after installation and follow the on-screen instructions to store your chat history. Open iTunes on your computer or Mac. Now it is time to connect your iPhone to the computer. It may take few seconds to let iTunes recognize your device. Go to File -> Devices -> Restore from Backup. If you are using Windows computer, the File menu is off by default. Press Alt key to invoke the file option. Choose a backup from the list, you can see back up data, file size. The restore process will take time according to size of your data, please wait till it completes. Connect your iPhone to PC and choose recovery mode. "Recover Data from iOS Device" mode is also the default mode. Your iPhone will be automatically detected by the tool. You have option to either select what you exactly want to scan or recover or simply click on "Select All" option. Select All option will initiate a deep and thorough scan. Now tap on "Start Scan". All the scanned files will be displayed. To recover, you can either select "Check all" option or just the "Only display the deleted items" option. 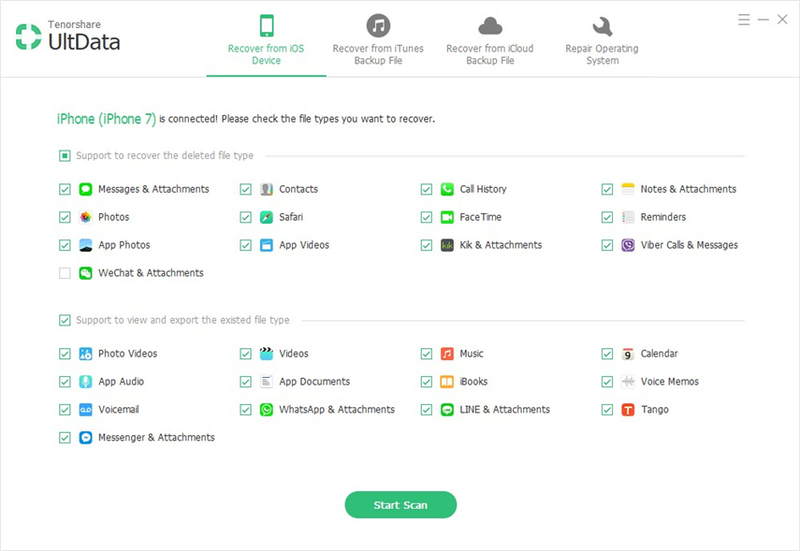 Once you are done with the selection of files to be recovered, tap on "Recover". You can recover the files to computer or to your device. Rename that file from "msgstore-YYYY-MM-DD.1.db.crypt7" to "msgstore.db.crypt7". These were some of the ways you can restore your WhatsApp on Android phones and iPhone too, we included bunch of methods and at the end also recommended all in one recovery tool for bot Android and iPhone.